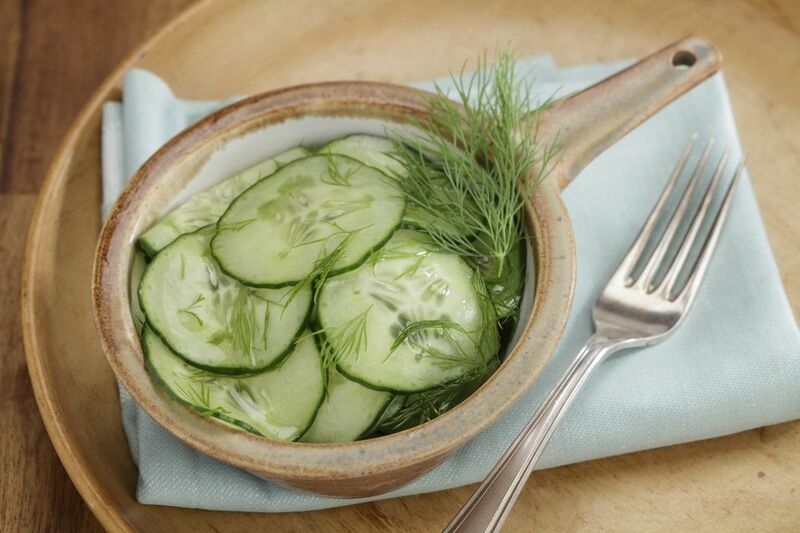 This German cucumber-dill salad, or gurkensalat, in a vinegar-and-sugar dressing, is a winning combination of flavors that makes a refreshing summer salad that goes well with many types of meat, especially pork. If dill and red onion isn't your thing, they can be left out and the result will still be a delicious salad. Wash the cucumber(s). If you have unwaxed, seedless cucumbers you can leave part or all of the skin on in strips (attractive when sliced). All others should be seeded and peeled. Using a mandoline, a food processor with the thin slicer attachment, or the slicer opening on a cheese grater, slice the cucumber(s) very thinly. Set aside. Make the dressing by placing the vinegar, sugar, salt, and pepper in a serving bowl and whisking until the sugar dissolves completely. Add the sliced cucumber, red onion rings, and chopped dill, if using, and toss well. Marinate for 5 or more minutes and serve. Braised Pork and Cabbage Recipe: This variation of a traditional German pig knuckle dish is made with pork belly braised on a bed of chopped cabbage. Boneless Mustard Pork Chops Recipe: This easy recipe is perfect for a busy day. It cooks up fast with a minimum amount of labor and tastes like you slaved all day. Stuffed Pork Loin Recipe: In this treatment, a pork loin is butterflied and stuffed, and then grilled over indirect, medium heat to let the inside cook before the outside gets burned and dried out.